Award, that is to say a special recognition of achievement. Greetings! I am pleased to say that my painting Three Minute Egg V11 earned the Fourth Place “High Desert” award in the Watercolor Society of Oregon (WSO) Spring Experimental Exhibition, Florence OR. (Yay!). The exhibition opened on Saturday, April 7th at the Florence Events Center, (715 Quince St) and you may view the show during business hours through the 23rd of April. I would like to send my deepest thanks to the sponsors of the Fourth Place “High Desert” Award: Jack Richeson & Co and the WSO 100 Club, Inc.
Jack Richeson & Co is one of the few family run art supply manufacturing companies remaining. Located in Wisconsin, their company “is based on a belief in the Importance of Art, its relevence, its necessity in life”, (quote from their Facebook page). I think its wonderful that they have nine full time working family members and the occasional seasonal member. Thank you Jack Richeson & Co! The WSO 100 Club is a non-profit corporation established by WSO in 1984 as an endowment fund. The purpose of the fund is to subsidize member education and the WSO Awards Program. Thank you WSO 100 Club! My watercolor is one of twenty award-winning paintings. The paintings will continue on in a traveling show through the end of September, including galleries in Florence, Newport and Carlton, (please see the schedule below). The Watercolor Society of Oregon (WSO) hosts two juried exhibitions per year: one in the fall and one in the spring. To explain the process for the show, artists submit paintings for consideration into a juried show. The submitted painting must past an initial jury to be accepted into the show. Then a juror (or jurors) selects award winners. In the case of this particular juried show, the juror accepted 80 paintings from 279 entered by 163 artists. And, from the shows 80 paintings, she selected 20 award winners. This spring’s Juror was artist Ms. Fran Larsen of Santa Fe NM. She is a nationally recognized artist and instructor. What’s special about the Spring show is that artists can be experimental. That is to say, while the paintings are primarily water media, they may incorporate elements of other media, like colored pencil, ink, pastel, etc. 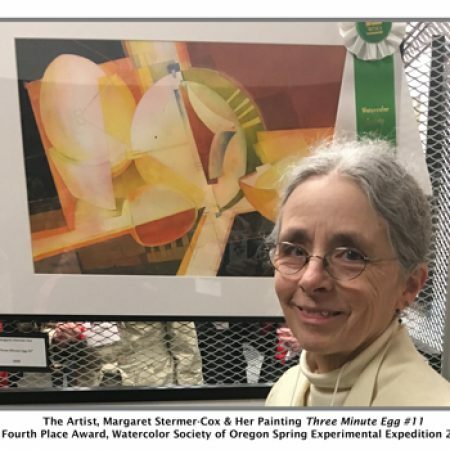 About the Watercolor Society of Oregon. The Watercolor Society of Oregon was started in 1966. The society currently has over 800 members from around the state. Its purpose is to promote the interest of watercolor paintings. The Spring Experimental Exhibition is one of two shows held annually in the state of Oregon. About the Painting, Three Minute Egg V11. This is the eleventh painting in a series of works exploring a still life setup. For background information, the set up includes eggs, egg cup, timer, spoon and napkin. With each new painting, I allow myself the freedom to explore composition, color, meaning and whatever else strikes my fancy. Incidentally, you may notice that in this painting I was playing with angles. So, what’s the meaning, you might ask. Well, three minute eggs were one of my favorite childhood breakfasts. Strangely enough, I didn’t particularly enjoy the taste of eggs. Instead, what I liked was being able to dunk my toast into the egg. Plus, we had egg cups from Spain which made the eggs ever more exotic. With that in mind, you might say this painting is about the memory of exotic breakfasts. Or, the breakfast where Peggy was allowed to play with eggs and toast! April 7 – 23. Florence Events Center, 715 Quince St., Florence OR. Hours: Mon – Fri: 9am to 4:30pm. April 24 – May 31. Backstreet Gallery, 1421 Bay Street, Florence OR. Opening reception Saturday, May 12 from 3-5 pm. Hours: 10am to 6pm daily. May 31st – July 31st. Newport Visual Arts Center, 777 NW Beach Dr., Newport OR. Hours: Tue – Sun: 12 noon to 4pm. August 1st – September 30th. Wallow Gallery, 125 W Main St., Carlton OR. Hours: Fri – Sun: 12 noon to 5pm. Paintings Showing At Linda Vista and Two Spring Daffodil Drawings	Talent: A Word Rattling Around My Brain! Plus, Its Where I Live.